Intertops Casino unveils their latest release from Realtime Gaming, Panda's Gold. The new game comes with three bonus features awarding up to 8X prize multipliers. To celebrate the release, Intertops Casino wants to give you some free spins to try the new game! There are three bonus games triggered by three, four or five scatters. During "Prosperity" free spins, Wilds triple payouts. "Wealth" free spins award up to 8X payouts. Five scatters trigger "Fortune" free games. All prizes are multiplied 5X. If there’s a Wild in the winning combination the prize is multiplied by 8. "I know a lot of players are going to love this new game just for the lovable Pandas!" said Intertops Casino's manager. "But I also think they're going to love the way you bet on 50 lines but can win on any one of the 88 pay lines!" Intertops Casino has been enjoyed and trusted by players all over the world for more than twenty years. The world's most trusted online casino is giving you up to 50 free spins on the new game when you make your next deposit. Intertops' Perfect Wave bonus competition continues until September 3rd. You earn points when you play and compete with other players for top prizes. Every Monday until September 3, the 300 players with the most points win up to $500 each. The top 20 are entered in a $1000 final draw. 50 randomly selected players win additional bonuses every Thursday. 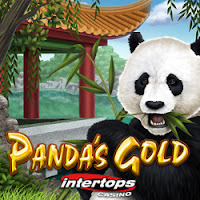 Panda's Gold is available in Intertops' download and instant play casinos for laptop and desktop players and in the mobile casino (https://casino.intertops.eu/en/instantplay) for those that play on their smartphones and tablets.